When I was a kid, my candy preferences consisted of the longest-lasting candies I could afford on my meager candy allowance. But when I felt like splurging, that splurge was often Bridge Mixture. To my childhood self, there was something sophisticated about Bridge Mixture â€“ the mixture of dark and milk chocolate coatings, the way that you never quite knew which filling you were going to get, just like in a â€œgrown-upâ€ box of chocolates, the fact that it was named after a complicated grown-up card game at a time when I only knew how to play Old Maid and Crazy Eights. -A 24-foot-tall granite statue of a box of Bridge Mixture stands in front of the factory where it was invented. The statue has been blessed by Pope Jean Paul II. So in the end, all I learned is that trusting Wikipedia for serious research purposes is probably a pretty dumb idea. I guess in the end, all we can say for sure about Bridge Mixture is that its true origins have been lost in the mists of time. There is real chocolate in the ingredients, which surprised me, since I remember them tasting pretty waxy, even when I was a kid. Sure enough, when I popped a few in my mouth, they were pretty much like I remembered â€“ if thatâ€™s real chocolate, itâ€™s been heavily cut with some kind of confectionerâ€™s glaze, making it hard and brittle. It readily flakes off of the harder centers when bitten, and thereâ€™s very little difference between the dark and the light. The caramel center is a little dense and chewy, and very mild-tasting. The fondants are all very hard, making me wonder about the freshness of this box. (Though really, I donâ€™t recall ever finding a soft fondant in a box of Bridge Mixture, so perhaps theyâ€™re not supposed to be that way.) The mint is a standard peppermint patty mint, and the orange has a tangy, perfumey (if a little stale-tasting) flavor that, more than any other piece, brings back memories of eating these as a child. Thereâ€™s also a third fondant, which I believe is supposed to be coconut, though it kind of tastes more like plain sugar than anything. The peanuts and raisins are, well, peanuts and raisins â€“ if youâ€™ve had Glossettes, youâ€™ve had these. The peanuts, like everything else, are a bit stale. The Turkish Delight pieces, from what I remember, came in red and green, and I donâ€™t even remember them tasting that good â€“ I think I liked them more for the texture and the novelty of a chocolate-coated gummy than anything. None of the above description really makes Bridge Mixture sound all that good, and I guess itâ€™s not. Yet Iâ€™m still downing the stuff by the handfuls as I write this review. Just nostalgia? Perhaps â€“ or maybe this Pope-sanctioned, Presidential-tooth-breaking candy has powers beyond the comprehension of mere mortals. Try someâ€¦ if you dare. how funny. i always thought bridge mix was dark and milk chocolate covered cashews and peanuts and almonds and raisins and stuff. i don’t remember fondant and turkish delight at all. I’m not a huge chocolate fan, but I definitely am curious to try the Turkish Delight ones because Turkish Delight is amazing. i’ve loved bridge mix since i was a kid. We always bought the Brach’s version in the US (never saw Hershey’s) and you can still find bags of it commonly in grocery stores, etc. 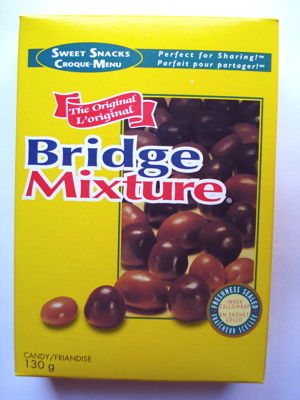 I love Bridge mix, but I am Very sad that the bag I got had very little milk chocolates carmels in it. To many mint and peanuts in it!